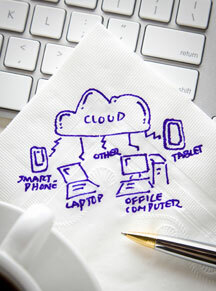 Cloud computing is now a viable solution for many businesses. There are specific IT challenges that the cloud addresses, often times providing a level of flexibility that no other solution can match, as well as saving you time and money. That is not to say that cloud computing is right for every business, only that when it is a good fit the advantages are often dramatic. When your computing needs call for solutions that will scale with the growth and change of your infrastructure, you will want a hosting environment based on cloud architecture. Built on virtualization and hosted services technologies, CIO’s cloud services enable your company to grow, change and comply with new or unforeseen IT requirements. Whether it be additional software or new security requirements, CIO’s cloud services make it easy and cost-efficient to be flexible. The cloud works well if you have a distributed workforce, with multiple offices or remote users, because they can utilize the anywhere/anytime access from any device (iPad, Android, etc.). The cloud also has better replication, backup, and faster recovery than most premise-based networks. Furthermore, the cloud eliminates in-house hardware maintenance and servicing, while having much better availability and reliability. CIO Private Cloud services help you create the secure, customized environment you need. Going with a service provider that has expertise in both premise-based systems as well as Private Cloud services enables a high level of customization and service. If you’re concerned about maintaining a healthy bottom line, the cloud can save you money by enabling you to rent (subscription), rather than own. This is especially beneficial because, typically, companies need to upgrade every few years. With the cloud, there are minimal upfront purchase costs –only subscription fees, meaning, you pay as you go and pay as you need (scaling the software licensing up and down as easily as the hardware). We are here to help you achieve peace of mind and to help you with your IT needs so you can focus on your business. Switching to cloud services is a big transition, but we have local resources to help you make that transition. CIO is the best company in the area at delivering cloud services for your business, because as Santa Barbara’s largest IT services company we have the staff and expertise to implement cloud services. At the same time, we are able to give you the time and attention that larger Los Angeles based companies are unable to provide. Take the next step and call us today at (805) 692-6700 for a free initial consultation, or email us to start your relationship with Santa Barbara’s most Trusted IT Provider. CIO have great customer support. It is consistently good. I have called after 5pm when I would expect most tech companies to be packing it in and these guys are answering the phones and have a great attitude. I have also noticed that they end their call with “my pleasure".